WattNode® meters are available in seven voltage ranges up to 600 Vac line-to-neutral. For service voltage above 600 Vac, potential or voltage transformers (PTs or VTs) are used to step down the voltage to a lower range that will work with a WattNode meter. PTs are used for medium voltage services above 600 Vac, but also sometimes for 575-600 Vac three-phase three-wire delta circuits. WattNode® for BACnet® meters and WattNode for LonWorks meters support PT ratios and can scale measurements internally. Other models will need to have the data scaled externally by the data collection system. If you are using a WattNode® for LonWorks® meter, we offer Option PT, which adds a configuration property UCPTptRatio which configures the ratio of the external PT, allowing the meter to automatically scale the voltage, power, and energy readings. For other models, you can also use PTs, but you will need to scale the meter measurements by the PT ratio for accurate results. Adding potential transformers has the effect of reducing the measured line voltage by the PT ratio (let’s say 35:1 for this example). So a voltage of 4200 Vac becomes 120 Vac. Since the meter sees 120 Vac, many of the measurements it reports will be low by a factor of 35 unless they are scaled up by 35. Power – since power is computed from the voltage and current. This includes all real, reactive, and apparent power values. Energy – This includes all real, reactive, and apparent energy values. When using a pulse meter, multiply the kWh scale factor by the PT ratio. The current, frequency, and power factor measurements are not affected by PTs. CCS supplies the WattNode meter rated up to 600 Vac and current transformers rated for use on circuits up to 600 Vac. CCS does not supply potential transformers, fuses, or CTs rated for use on medium voltage circuits, so you will need to find other suppliers for these components. We call this technique piggybacking. LonWorks meters (–FT10) are shown in the following drawings, but this piggybacking scheme works with any type of meter. Note that potential transformers are only required for medium voltage services above 600V. When piggybacking CTs, it is difficult to determine which direction the CTs should face, so just guess and install them all facing the same direction. If the power readings are minus, reverse the CTs or swap the black and white wires. When you use two CTs together like this (a ratio CT combined with a voltage output CT), you should use the primary current of the ratio CT as the full scale current rating value for the WattNode meter. For example, if the medium voltage CT has a 500:5 ratio, use 500 as the full scale current rating of the CTs. It may be difficult to determine the correct polarity (which direction is the source) when installing and wiring a 0.333 Vac CT on one of the ratio CT output leads. You have a 50/50 chance of getting it right. Just be consistent and install all three CT the same way. For example, install the 5 amp CTs on the ratio CT wire connected to the X1 terminal with the label facing toward the ratio CT and connect the white and black wires to the appropriate terminals on the WattNode meter. Check the status LEDs or individual A, B, and C power (kW) readings, if available. If any of the status LEDs are flashing red or there are negative power readings, swap the white and black CT wires where they connect to the WattNode meter screw terminals. This section describes the most common service types and PT circuits encountered. It provides recommended wiring diagrams and information on the measurements. In most cases, PTs are used with medium voltage circuits ranging from 2400 Vac to 35,000 Vac, so this will show medium voltage examples. The same circuits may also be used for lower or high voltage PTs. Floating: In many cases, delta wound transformers are left ungrounded. This has the advantage of allowing a ground fault on one of the phases from tripping the breaker and disrupting service. Corner Ground: One corner, typically phase B, is grounded. Center Ground: In this configuration, one winding is center-tapped and the center point tied to ground. Other: Other possibilities are possible (though uncommon) and include resistive grounding and inductive grounding. All of the above grounding configurations (including floating) can be monitored as shown in Figure 3 below. This can use two or three element PTs. The third PT element is redundant (unnecessary) for this configuration and is shown in gray in the figure. As a result of grounding the phase B output of the PT, the WattNode meter will only report voltage, current, power, and energy for two phases: phase A and phase C.
Blondel’s theorem explains that the sum results (PowerSum and EnergySum) are accurate with this configuration. However, the reported power, reactive power, and power factor for the two individual phases may appear imbalanced, even if the actual load is balanced, so in this configuration, only the power and energy sums are meaningful. Because CCS does not offer a WattNode model that supports a delta circuit with 120 Vac line-to-line, you must wire the meter line-to-neutral. Therefore, we recommend using phase B as the reference and tying it to ground and neutral. This will result in zero readings for phase B from the meter. Note, the PT primaries are monitoring the medium voltage line-to-line voltages, so select the PT ratio based on the line-to-line voltages. This is a medium voltage wye service with a neutral conductor. The utility transformer may be a delta-wye (shown below) or a wye-wye transformer. In this configuration, the PT primaries and secondaries are both wired in wye configurations. If either side of the PT were wired in a delta, it would cause a 30° voltage phase shift and incorrect readings. Note, the PT primaries monitor the medium voltage line-to-neutral voltages, not the line-to-line voltages. So be careful to select the correct PT ratio. For example, if the medium voltage circuit is 4160/2400Y (2400 Vac line-to-neutral) you would need a 20:1 PT ratio to step the voltage down to 120 Vac. This is the same as the four-wire wye service except no neutral wire is brought out to the load. VA to ground, VB to ground, and VC to ground are all nearly equal. The ground potential is the same as neutral if neutral were used. Three-wire wye service can be monitored with two different PT configurations. Two-Element PT: See Figure 3: Monitoring a Delta Circuit. Three-Element PT (Wye Output): This is the preferred PT configuration, because the meter will provide per-phase voltage, current, power, and energy readings for all three phases. In this configuration, the PT primaries and secondaries are both wired in wye configurations. If one side of the PT were wired in a delta, it would cause a 30° voltage phase shift and incorrect readings. Note, the PT primaries are monitoring the medium voltage line-to-ground voltages, not the line-to-line voltages. So be sure to select the correct PT ratio. For example, if the medium voltage circuit is a delta with 4160 Vac line-to-line, then the line-to-ground voltages will be 2400 Vac and you would need a 20:1 PT ratio to step down to 120 Vac. 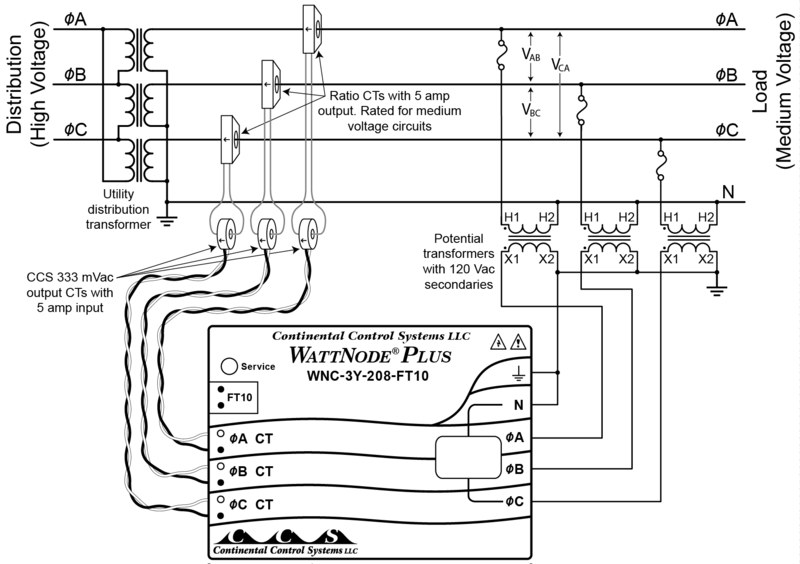 Do not use the circuit in Figure 7 if the medium voltage service does not come from a distribution transformer with a wye secondary, because the PT primary voltages may be indeterminate or mismatched. Potential transformers convert medium (or high) utility voltages down to a lower voltage that is compatible with the WattNode meters. PTs are described by the step-down ratio as shown in the following table of common ratios. The PT Ratio values are just the primary voltage divided by the secondary voltage. For example, 4200 / 120 = 35. In rare cases, it is also possible to use a reverse PT to step up a lower voltage like 12 Vac to 120 Vac to enable a WattNode meter to monitor 12 or 24 Vac power consumption. This would result in PT ratios like 0.1 (12 Vac to 120 Vac) or 0.2 (24 Vac to 120 Vac). In the United States and Canada, most PTs have a secondary voltage of 120 Vac, so we have assumed that for this supplement. If your PT has a different secondary voltage, you will need to make sure the WattNode meter’s voltage rating matches the secondary voltage. The following table shows some possible PT secondary voltages and the associated WattNode models you would use. Note: Because CCS does not offer a model with a power supply that can operate from 120 Vac line-to-line or 69 Vac line-to-neutral, it may be necessary to tie one PT output voltage to neutral and ground as shown in Figure 3. See MS-20-WNC-LonWorks-Option-PT.pdf for more details about using PTs with WattNode for LonWorks meters. If you have or are ordering a WattNode for LonWorks with Option PT, you can specify the PT ratio so that the meter will automatically scale the voltage, power, and energy values. Once you have determined the correct PT ratio, program this into UCPTptRatio using LonMaker®, the WattNode LNS® Plug-In, or another LonWorks tool. UCPTptRatio is limited to the range 0.05 to 300. If you try to configure a value less than 0.05 or greater than 300, the meter will revert to a PT ratio of 1.0 (effectively no PT). The value following the ‘PT=’ must be the ratio as a single number. Do not specify the primary voltage or two numbers separated by a colon. If you do not know the PT ratio when you are ordering the meter, then add “Opt PT” to the model. The meter will ship with the PT ratio set to 1.0 and will need to be field configured. The WattNode for LonWorks and WattNode Modbus models have an internal energy rollover point of 100 GWh (100,000,000 kWh). When the energy reaches the rollover point, it rolls over to zero (like an odometer rolling around to zero). Generally it requires years to reach this rollover point, but with Option PT, rollovers could occur much more often. For example, in an extreme case, with the maximum PT ratio of 300, 5000 amp current transformers, and a very high continuous load of 75% of maximum, the energy could reach 100 GWh in as little as 30 days. A more realistic example might be a PT ratio of 60 (7200 Vac) and 2000 amp CTs, resulting in a rollover roughly once per year. The WattNode meter will be powered from the PT secondaries, so you will need to select a PT with a high enough burden rating. WattNode models draw between 2 and 4 VA at a power factor (PF) between 0.6 and 0.8, and so require a potential transformer that is rated for that burden. There are standard IEEE/ANSI C57.13 letter codes for PTs rated to handle different burdens. For non-standard PTs, check with the manufacturer. W: 12.5 VA @ 0.10 PF. WattNode meters draw far less than 12.5 VA, but the meter power factor is much higher than 0.10, so the accuracy of the PT might be affected. X: 25 VA @ 0.70 PF. This can easily supply a WattNode meter. M: 35 VA @ 0.20 PF. WattNode meters draw far less than 35 VA, but the meter power factor is higher than 0.20, so the accuracy of the PT might be affected. Y: 75 VA @ 0.85 PF. This can easily supply a WattNode meter. Z: 200 VA @ 0.85 PF. This can easily supply a WattNode meter.